Castleford Tigers survived a spirited second-half fightback from Leeds Rhinos to earn a narrow win at Elland Road. Leeds, who had beaten leaders St Helens last time out, hit back from 15 points down at half-time but Tigers clung on to earn victory by a single point. Rhinos' Kallum Watkins kicked wide from a conversion attempt which may have won it with less than two minutes to go. Luke Gale's five successful first-half kicks for the visitors - including a drop goal - proved decisive for Tigers. Jamie Ellis, James Clare, Alex Foster and Junior Moors all went over for the away side in an excellent first-half display, putting Tigers 24-0 up. Watkins and Ash Handley replied for the hosts, before Gale's drop goal gave Tigers a 25-10 half-time lead. After the break, Watkins and Handley both got their second tries before Ryan Hall's late score presented Watkins with the pressure chance to put Leeds ahead for the first time, but to no avail. Brian McDermott was without several first-team players for his 200th league game in charge and his side narrowly missed the chance to move above Wakefield in the table, as they lost at Warrington. 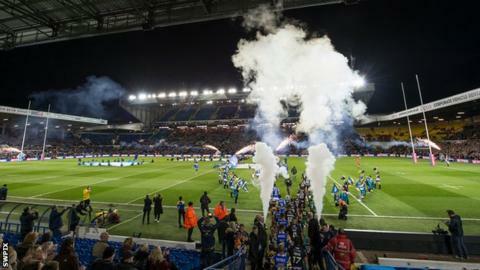 The attendance of 23,246 was just 1,758 less than the 13-year-old Super League record for a match away from the Grand Final, set at Wigan in March 2005. Leeds coach Brian McDermott: "It's a funny game to sum up. I thought we were very courageous. At 24-0 down, we went at Cas and cracked them a couple of times. "Whenever you attack as much as we did, there is always a chance of stretching yourself. Defensively we were very good at times, but then you've got to point the finger at the first 15 minutes. "For the first 15 minutes, there was just too much wrong with our game. I don't think we were unbelievably poor. There were just too many things not right and Cas exploited them. "We were off and they were gifted some field position and repeat sets through penalties. We needed to be better in that first 15 minutes and for that reason we didn't deserve to win." Castleford coach Daryl Powell: "On balance, Leeds probably just shaded us over the 80 minutes. But we'll take it and move on. We're in a good spot, we've won four straight and there's loads to come from us. "It was an interesting game. I couldn't believe that throw-away drop goal just before half-time won us the game. "There was so much drama. We started like a house on fire. Everything we talked about, the boys applied it to the letter. We looked sharp and scored some outstanding tries. "I don't know what happened. We haven't played many games so perhaps we're not conditioned for the brutal rigours of rugby league. Leeds played really well and challenged us. They hang about. They just never go away." Leeds: Golding, Briscoe, Watkins, Handley, Hall, Moon, Myler, Mullally, Parcell, Singleton, Jones-Buchanan, Ablett, Delaney. Substitutes: Walker, Smith, Oledzki, Walters. Castleford: Clare, Cook, Ellis, Foster, Gale, Green, Hitchcox, Massey, McMeeken, McShane, Millington, Milner, Minikin, Moors, Roberts, Shenton, Springer, Trueman, Webster. Substitutes: Moors, Cook, Trueman, Green.